The passport provision is now official, as President Obama signed the 5-year infrastructure spending Bill. It adds a new section 7345 to the Internal Revenue Code. It is part of H.R. 22 – Fixing America’s Surface Transportation Act, the “FAST Act.” Why are passport covered in the tax code, you might ask? The title of the new section is “Revocation or Denial of Passport in Case of Certain Tax Delinquencies.” The idea goes back to 2012, when the Government Accountability Office reported on the potential for using the issuance of passports to collect taxes. It was controversial then, but this time sailed through, slipped into the massive highway funding bill, passed here. The section on passports begins on page 1,113. The joint explanatory statement is here, beginning on page 38. The law says the State Department can revoke, deny or limit passports for anyone the IRS certifies as having a seriously delinquent tax debt in an amount in excess of $50,000. Administrative details are scant. It could mean no new passport and no renewal. It could even mean the State Department will rescind existing passports. The State Department will evidently act when the IRS tells them, and that upsets some people. We think of passports when traveling internationally, but some people may find that passports are required for domestic travel in 2016. That could make the IRS hold even more serious. The list of affected taxpayers will be compiled by the IRS. The IRS will use a threshold of $50,000 of unpaid federal taxes. But this $50,000 figure includes penalties and interest. And as everyone knows, interest and penalties can add up fast. Notably, if you are contesting a proposed tax bill administratively with the IRS or in court, that should not count. That is not yet a tax debt. There is also an administrative exception, allowing the State Department to issue a passport in an emergency or for humanitarian reasons. But how that will work isn’t clear, nor is the amount of time it will take to get special dispensation. You would still be able to travel if your tax debt is being paid in a timely manner, as under a signed installment agreement. The rules are not limited to criminal tax cases or where the government thinks you are fleeing a tax debt. 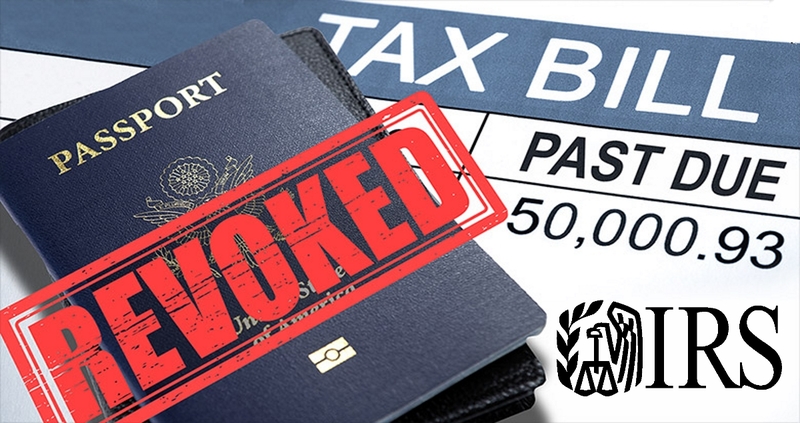 In fact, you could have your passport revoked merely because you owe more than $50,000 and the IRS has filed a notice of lien. A $50,000 tax debt including interest and penalties is common, and the IRS files tax liens routinely. It’s the IRS way of putting creditors on notice. The IRS can file a Notice of Federal Tax Lien after the IRS assesses the liability, sends a Notice and Demand for Payment, and you fail to pay in full within 10 days. If it’s not clear already, it is now an absolute necessity for Americans abroad to obtain a legitimate second passport — by any means necessary. As is typical of their kind, politicians stuffed and pork-barreled the amendment into a boring and largely ignored bill, 52102(d) of the Transportation Funding Act of 2015. (The full text can be found at bottom of article.) This change officially turns you, Mr. Expat, into a global tax slave for the US. The US is one of only two countries in the world that taxes its citizens on their worldwide income (as opposed to residency). This is essentially taxation without representation, as expats don’t live in any state in the US, and senators and state representatives represent states. So expats typically have voting rights in the state that they previously resided. A friend of mine, who is a fellow expat and international tax attorney specializing in US expat tax issues, suggests solving this issue by setting up residency in Florida. Not only is it very easy to get a driver’s license there, but there is also no state tax, and Florida has the most international city in the US — Miami. The only way to address the new ruling is to obtain a second passport. Now more than ever, there is a clear and obvious reason to obtain one. I interpret this bill to mean that the IRS can revoke your passport if you owe back taxes or have un-filed returns. Failure to file typically results in returns being prepared on your behalf by the IRS computers, with no human interaction. In other words, if you don’t file a return, you’ll face a computer-generated return that creates a balance due and a tax debt, and in turn, a cancelled passport. If you don’t have a second passport, you will have no right to an appeal, to speak with an attorney, to plead your case to a judge in your country, or any way to prevent being sent back to the US to face the IRS. Without valid travel document, you are in legal limbo and have no recourse or rights. You see, the IRS will revoke your passport while you are in transit. The agency knows when you are flying from one country to another, and will, with just a few keystrokes, revoke your passport while you are in the air. When you land and attempt to enter your destination country, you will find your passport invalid. The airline that you traveled with is now required to return you to the country that issued your passport. You have no right to an attorney, no right to enter the country to fight the claim of a certified debt, and no right to an appeal. You will be held in the transit area under guard until you are put on the next flight to the US. Think of Tom Hanks’ character in movie The Terminal, or Edward Snowden. Unless Mr. Putin comes to your rescue, you are headed back to the States. Being denied admission to a country is not the same as being extradited. Once you are in a country, you have all the rights conveyed by its legal system and courts. When you’re in transit, you have no rights — you are at the mercy of the country whose passport you hold. If you don’t have a valid travel document, your only choice is to return to your home country. 1. By heritage. If your parents or grandparents were born outside of the US, you may be eligible for citizenship from their original country. If you would like us to review your heritage options, please email us at support@passports.io. 2. By marriage. Most countries grant residency and then citizenship to the spouse of a citizen, though normally only after a period of residency. 3. By investment or cash payment. You can make an investment and/or pay cash to get a second passport immediately. If you have the money to spend and invest, you have many options. Every citizenship-by-investment option globally is listed at Passports.IO. 4. Earn citizenship through residency. In some countries, you can become a resident, contribute to their economy and culture, and earn the right to apply for citizenship after a few years. We also include many different residency-to-citizenship options at Passports.IO. As a resident you have more rights to contest an attack by the IRS. A tourist has little or no standing, while a resident is given status by the fact that he or she is a lawful member of the community. A resident may also stay in a country for as long as he wishes. A tourist must usually travel outside the country every four or six months, putting him at risk with each and every trip. Also, if you’re caught overstaying your tourist visa, you can be removed from the country — something that commonly happens with tourists in many different parts of the world. Most importantly, some forms of residency lead to citizenship after a few years. For example, if you have been a resident of Panama for four years, you can apply for citizenship, and with citizenship comes a passport. A Panama passport is an excellent travel document, so I recommend that program for anyone who wants to “earn” citizenship over a number of years rather than purchase it. Paraguay, Uruguay are similar options in South America. Whatever the country, it’s clear and obvious that if you don’t already have a second passport – now is the time to start taking action in this direction.